In 1999, Georges Dreyfus, the first western Geshe (a degree yet earned by Kelsang Gyatso) wrote an article entitled, The Shuk-den Affair: Origins of a Controversy. Georges Dreyfus also earned the Geshey Lharampa degree, the highest rank of Geshey offered in the Geluk academies and now teaches at Williams College in Massachusetts as Jackson Professor of Religion. NKT claims that the article is nothing more than a scholarly version of A Brief History of Opposition to Shugden, published October 1998 by The Dolgyal Research Committee of the Tibet Government in Exile. NKT claims that Dreyfus was, "falsely accusing the highly revered Gelugpa Lama Je Phabongkhapa of possessing a sectarian agenda...There is an overwhelming amount of evidence of texts supporting Shugden before Pabongkha (1878-1943), yet almost no one seems interested in it, and of course the detractors benefit greatly from the “murky origins” of this practice." Something wrong with being scholarly? 'Murky origins' indeed. Certainly, Georges Dreyfus 'paid his dues' in his dedication to and life's work in Buddhism, more than anyone can say inside NKT. Learning long ago that honesty is not one of NKT's traits, I wondered about the validity of NKT's denigration of Georges Dreyfus. Fortunately, he has written a captivating book about his time as a Tibetan monk, The Sounds of Two Hands Clapping: The Education of a Tibetan Monk (2003), enabling an unfiltered exploration into his qualities, observations and experiences. Numerous historians, Tibetans, monks, and Tibetan Buddhist leaders support Georges Dreyfus's assessment, as does Phabongkhapa himself. After reading George Dreyfus's book in the context of broader study of Tibetan history, I have concluded that his work is credible. George Dreyfus studied in depth a full range of scholastic works, including substantial memorization of the core Buddhist scriptures and extensive practice of monastic debates. George Dreyfus was the first westerner to complete training at the Buddhist School of Dialectics in Dharamsala, India (he was in the schools inaugural class). He was a Tibetan monk during the 1970s and 1980s and experienced the Shugden controversy inside his Tibetan training - a vantage point more substantial than that within NKT. Also in agreement with historians, Georges Dreyfus observed that, "By gradually acquiring preeminence through their strong political ties with the political authorities in Lhasa, these three monastic centers (Ganden, Drepung, Sera) have provided the basis of this school's supremacy. It is only gradually that the sectarian rift between the new Gaden group and the other traditions formed." Responding to sectarianism promoted by Tsongkhapa's disciple, Kaydrup, Gadenpas (later called Gelugpas) strengthened their sense of orthodoxy to form a separate tradition claiming superiority. "The sectarian process was further strengthened by the political climate of the times, particularly the power struggle between the forces of Tsang and the forces from Central Tibet. It is these events, more than intrinsic doctrinal differences, that led to the rigid division that has characterized Tibetan Buddhism the last few centuries...The first group to assume power over Tibet was...the Sagya school. After the second half of the fifteenth century, the situation deteriorated into a full-fledged civil war between Tsang and Central Tibet, each supported by rival religious schools...Under the protection of the central government, the Geluk school became by far the most powerful...Political events played a crucial role in the formation of Buddhist schools in Tibet. Whereas Indian schools reflected the lines of doctrinal disputes or distinctions in monastic ordination, the creation of Tibetan schools has often owed more to the chance occurrences of history and to political expediencies than to substantive religious or philosophical differences...Under such circumstances, differences are based mostly on personal allegiances and political alliances." Regarding the Rime nonsectarian movement beginning in the 19th century (not by the current Dalai Lama as NKT contends), "The Geluk tradition has been divided in its reaction to this revival...Other Geluk thinkers, however, have been sharply critical of this interest in nonsectarianism. The most famous was Pabongka, who spearheaded a revival movement partly directed against nonsectarian influence on the Geluk tradition." The Rime movement began around the charismatic personalities of Jamgon, Gongtrul, Jamyang Tyentsewangpo and Dza Patrul. "Disgusted by the rivalries that had torn apart the ruling family of Derge, these teachers promoted an inclusing approach in which all traditions were recognized as valid." In his book, Georges Dreyfus also delves into Tibetan spirit cults. "Protectors are gods from whom Buddhist practitioners can request protection and help. Some are supramundane, such as Six-Armed Mahakala...Because they are beyond the concerns of the world, their worship creates no difficulties. But because their distance from the world also makes their protection weak, people often rely on the more problematic but more potent and close mundane protectors. 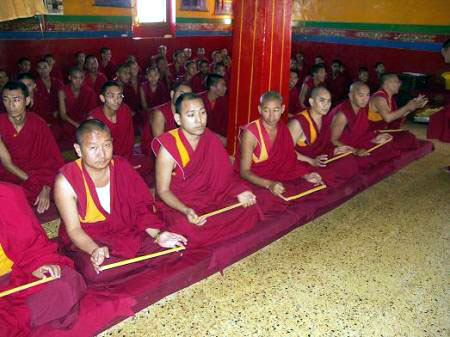 These violent spirits have taken an oath...to protect the Buddhist teaching. Despite this commitment, they are not completely tamed and are proned to quasi-human emotions such as anger, jealousy, and so forth. Hence, they are partial and can be enlisted in morally unseemly actions such as helping practitioners to secure worldly advantages or even killing an adversary. Because the practices of these deities are in tension with normative Buddhist ideals, they can only be propitiated, not worshiped...Protectors also figure prominently in the life of monasteries, where they serve as focal points of collective identity...This reliance on protectors makes perfect sense, given the traditional conception of the universe as alive with invisible entities. In such a universe, protection from the unseen is important...The importance of this relationship becomes clear if one remembers that the deities who are protectors are defined as such because they protect the person or the group, often by violent means, from enemies...Because the protectors are in charge of enforcing this distinction, they are closely related to the monks' sense of identity and affiliation, and it comes as no surprise that they figure prominently in the ritual life of Tibetan monasteries." "Many Tibetans feel the tension between the reliance on these deities and the normative ideals of the tradition...Typical in this respect is the controversy I have described elsewhere as the 'Shuk-den Affair,' which concerned the protector Gyelchen Dorje Shukden...It started in the mid 1970s, when the Dalai Lama issued cautionary statements...reacting to the publication of a 1973 work promoting Shukden by a learned Geluk scholar, Dzemay Rinpoche. In the Yellow Book, Dzemay Rinpoche charges that the Geluk Lamas should absolutely not practice the teachings from other schools, or else they would incur Shukden's wrath and die prematurely...Typical is the fate of the Fifth Panchen Lama, Lobzang Palden, who is described as incurring Shukden's anger because he adopted Nyingma practices...After a ritual self defense that backfired, he died at the age of twenty nine. Many similar incidents are described by Dzemay...the most conservative elements of the Geluk tradition...see in Shukden the spirit in charge of defending the integrity of the Geluk tradition by 'taking care' of those, such as the Dalai Lama, who are tempted to adopt practices from other schools." Regardless of one's proclivity to propitiate Shukden or not, George Dreyfus's book is a highly recommended journey into Tibetan monasticism. "Hence, an examination of the ways in which Tibetan monks are educated can provide an important view of the depth and richness of Tibetan culture. It can also correct the excessive emphasis on the mystical and romantic that at times have been the focus of Western understanding of Tibetan culture." After considering the book quietly during one of my walks, once again I felt queasy about NKT's dogma and the credentials of its founder, Kelsang Gyatso. Once again, I felt like an exploited stooge for hoping that NKT could tell the truth. I slipped into a sadness over the dead-end trajectories of NKT's clergy and students. The world does not need Kelsang Gyatso's exportation of Shugden vengence or NKT's protest rallies and caustic Internet web sites and blog posts to protect Shugden. "The controversy has spread beyond the borders of Tibet and the 100,000-strong exile community in India. It also threatens to undermine the Dalai Lama's authority as he presses demands that China end its 58-year occupation of Tibet. Gleefully exploiting the schism for its own political ends is the Chinese government. China is rebuilding Shugden monasteries in Tibet and giving priority to sect members applying for exit permits. 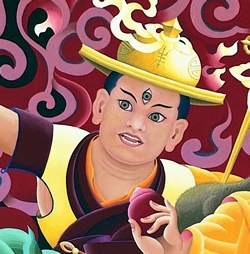 Today, the fearsome deity is worshiped by the fastest-growing Buddhist sect in the West, the New Kadampa Tradition (NKT). Its founder, Kelsang Gyatso, known as the "Third Buddha" to his followers, is a sworn enemy of the Dalai Lama. Unraveling the Shugden controversy involves delving into the intricate palace intrigues of 17th-century feudal Tibet and the complexities of medieval Tibetan Buddhism teeming with deities and demons. According to myth, Dorje Shugden is the spirit of a powerful abbot who was found dead in his palace in Tibet in 1655. Shugden worship was first banned some 350 years ago by the Fifth Dalai Lama, who declared him an evil spirit. Although Tsering (Chime Tsering, secretary of the Dorje Shugden Society in New Delhi) denies China is supporting his group, he admits that his society has links with the NKT, which has been carrying out a smear campaign against the Tibetan leader. For its part, the Tibetan government-in-exile believes the Shugden controversy will lead to more violence as Beijing tries to exploit its potential for damaging the Dalai Lama's image." "If it (Shugden) were a real protector, it should protect the people. There may not be any protector such as this, which needs to be protected by the people. Is it proper to disturb the peace and harmony by causing conflicts, unleashing terror and shooting demonous words in order to please the Dharma protector? Does this fulfill the wishes of our great masters?...Try to analyze and contemplate on the teachings that had been taught in the Lamrim (stages of path), Lojong (training of mind) and other scriptural texts. Does devoting time in framing detrimental plots and committing degrading act, which seems no different from the act of attacking monasteries wielding swords and spears and draining the holy robes of the Buddha with blood, fulfill the wishes of our great masters?" "On January 22 all the monks from Tashi Lhunpo Monastery in exile gathered to deliberate over Dorjee Shugden issue. The monastery of Tashi Lhunpo, which has always been dedicated and devoted to His Holiness’ welfare as well as to the Central Government’s policy, formally declared that the problematic Dolgyal Shugden was not worshipped or propitiated by the monks of its monastery, nor will it be in the future. In the evening of January 22 the entire community gathered in the prayer hall and each and every single monk took a formal oath in front of the pictures of Gyalwa Gedun Drup, the 10th Panchen Lama and Tashi Lhunpo’s protector deity Palden Lhamo not to rely, practice and worship Dolgyal Shugden under no circumstances. On 26th January, Tashi Lhunpo monks swore once more in the presence of dignitaries from the religious and political departments of the exile Government by drawing and counting wood sticks (tshul-shing). This came to confirm the already known stance that Dolgyal Shugden was not propitiated by the monks of Tashi Lhunpo. Finally the office of the monastery stated that Tashi Lhunpo Monastery does not want to have any kind of relationship whatsoever with individuals, groups or organisations dealing with Dolgyal Dorjee Shugden." Tashi Lhunpo monks hold wood sticks (tsul-shing) in a formal oath taking ceremony to vow “not to rely, practice and worship Dolgyal Shugden”. The 11th Panchen Lama, Gedun Choekyi Nyima, son of Kunchok Phuntsok and Dechen Choedon, was born on April 25, 1989 and was officially proclaimed as the true reincarnate of the 10th Panchen Lama, who died unexpectedly after delivering an historic anti-Chinese government speech. The young Panchen Lama is presently the youngest political prisoner in the world and we appeal to the international community, non governmental organizations and every individual to demand the Chinese authorities release and ensure the safety and well-being of H.H. the Panchen Lama, Gedun Choekyi Nyima. Why is Beijing so worked up over this issue? China seeks to legitimize its rule in Tibet by claiming it plays a crucial role in the identification of Tibet's two most important spiritual leaders, the Dalai Lama and in this case the Panchen Lama. In May 1995 Gedun Choekyi Nyima, the six-year-old boy identified by His Holiness the Dalai Lama as the 11th Panchen Lama, disappeared. Suspicions that he had been kidnapped were confirmed in May 1996 when the Chinese leadership admitted to holding him and his family in "protective custody." After repeated attempts to gain access to the boy, no international agencies or human rights organizations (including the United Nations) have been allowed to visit Gedun Choekyi Nyima or his family, and their condition remains uncertain. In an attempt to establish their authority over all "internal affairs" of China (political or otherwise) the Chinese leadership nominated and selected their own 11th Panchen Lama in November 1995. Their selection, a six-year-old boy named Gyaltsen Norbu, is another young victim in China's plan to undermine and control the Tibetan people, their religion, and their nation. The first Panchen Lama was Khedrup Je, the foremost disciple of Tsongkhapa and before which, like Tsongkhapa, was a Sakya scholar. Traditionally, there were considered to be four Indian and three Tibetan incarnations before Khedrup, starting with Subhuti, one of the original disciples of Gautama Buddha. He played an important role in the education of the First Dalai Lama, who was the youngest of Tsongkhapa's five chief disciples.